For a histogram, the location of tick marks determines the bins used to visualize the frequency distribution. Therefore, the Histogram class has some special rules for specifying tick marks. Create a histogram by adding the following statements at the bottom of the program window, and select Program Run from the main menu. 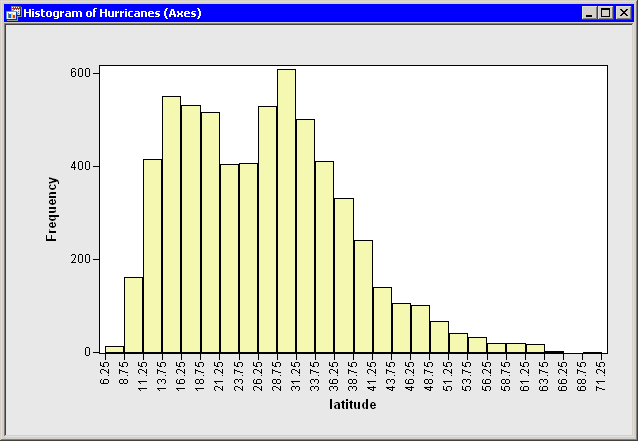 These statements create a histogram from the latitude variable as shown in Figure 9.5. To avoid having the histogram appear on top of the scatter plot, the SetWindowPosition method is called to move the histogram into the lower right corner of the SAS/IML Studio workspace. For a histogram, the major tick unit is also the width of each histogram bin. The tick marks for this histogram are anchored at 6.25 and have a tick unit of 2.5. The following steps show you how to change the location of the histogram ticks so that the bins show the frequency of observations in the intervals 5–10, 10–15, 15–20, and so on. 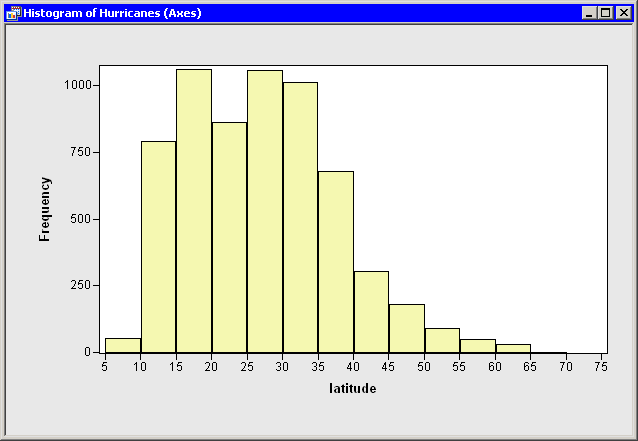 Right-click on the horizontal axis of the histogram. 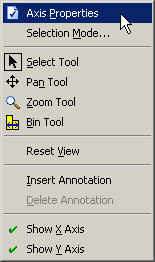 A pop-up menu appears as in Figure 9.6. Select Axis Properties from the pop-up menu. 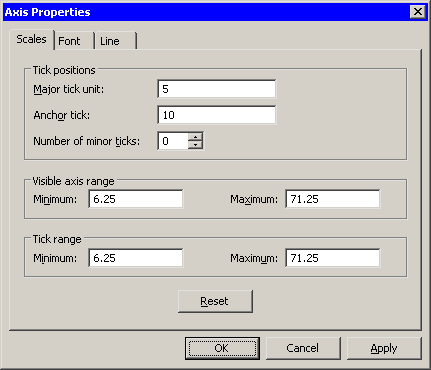 The Axis Properties dialog box appears as in Figure 9.7. This is a quick way to determine the anchor location, tick unit, and tick range for an axis. Change the value in the Major tick unit box to 5. Change the value in the Anchor tick box to 10. The histogram updates to reflect the new histogram bin locations (Figure 9.8). The visible axis range and the tick range (both shown in Figure 9.7) are automatically widened, if necessary, so that all histogram bins are visible. Another solution is to use the SetAxisNumericTicks method of the Plot class to change the bin locations of a histogram. This method requires that you specify the tick anchor, unit, and range, all in the same call.